John Tefteller Buys and Sells the World's Rarest Records! 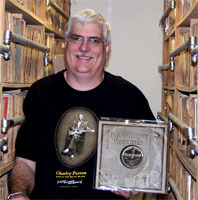 John finds another "lost" Paramount 78 rpm record!! John's 2019 Blues Calendar is STILL SHIPPING, but we're ALMOST SOLD OUT! Buy now if you want to be sure to get one! Welcome to my Killer Blues 45's & 78's auction! My VG+ grade is very tough so many records I grade VG+ would be VG++ or M- to most graders. My name is John Tefteller-I have been buying and selling rare phonograph records for the past 35 years. I have a worldwide reputation for my knowledge of rare records, especially Blues 78's. My personal collection contains some of the rarest records on the planet. My auctions in Discoveries magazine featured some of the rarest records on the planet. Many have sold for "record" prices. For top quality records, no one can top The World's Rarest Records! I have the world's largest inventory of Blues, Rhythm & Blues and Rock & Roll 78's with over 75,000 in stock. I also have a fabulous selection of over 100,000 45's from the 1950's and early 1960's in the following categories: Blues, Rhythm & Blues, Rockabilly, Rock & Roll, Girl Groups, Surf and Country. I am always interested in buying more rare records! I will pay top dollar for your rare Blues and Rhythm & Blues 45's and 78's in Near Mint condition. Before you sell your rare records to ANYONE, you should at least talk to me. I consistently pay the highest prices for records for my collection and am more than fair when buying for resale. Email my webmaster to sign up for my email newsletter! I'll have upcoming auction highlights. We will NEVER give out your information to ANYONE! Don't forget to bid and to get your bids in early! If you really want to secure your selections, please take advantage of my "call back" system. Questions? Call my cell phone: (541) 659-7175. Good luck to all! Good luck on your bids, everyone! This is the BEST overall selection of Rock & Roll 78's that I've EVER offered! Most are USA pressings but some are VERY SCARCE FOREIGN PRESSINGS that were made in the USA, including TWO BEATLES 78's! Girl Groups, Girl Singers, Teen Girls 45's! !